If you live on the Channel Islands, Shetland, Hebrides or any other of the islands surrounding Great Britain, you may not be aware that you are subsidising insurance rates for those living on the British mainland. Now Adrian Flux has launched a new range of insurance policies which reflect the low-risk nature of island life, with what we believe are some of the lowest premiums on the market. After studying accident and claims figures, we saw that the Islands surrounding Great Britain are very low risk areas. We take into account the low crime and accident rates to try and give you the most competitive rate available. So whether you live in the Channel Islands or the Outer Hebrides, our island insurance schemes can save you money, without compromising at all on the level of cover you can enjoy. It is no wonder there are fewer accidents and insurance claims in the islands around mainland Britain, the slower speeds, quieter roads and a much lower lower risk of theft all combine to mean lower premiums for you. Whether you need buildings insurance, contents insurance or a comprehensive building and contents policy, we can find the right level of cover for you. As we are a specialist insurance provider, if your insurance needs are a little out of the ordinary, we can usually offer a great rate where other companies would struggle to even quote. 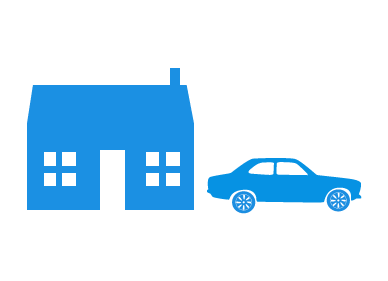 So whether your island home is a small flat or a castle, we can help with an insurance policy that suits your particular requirements. Landlords Insurance cover for both single property and portfolio insurance, also flexible for a rapidly changing property portfolio. High Net Worth Policies - covering period properties, high-value dwellings and contents cover, and cover for antiques and valuables. We offer high quality motorbike insurance through Bikesure, Adrian Flux's specialist bike department. Our aim is to provide policies to suit the individual needs of the client, and this personal and bespoke approach to providing motorcycle policies has put us at the forefront of specialist vehicle insurance. Because each island has its own peculiarities and everyone's needs will differ somewhat, our staff will use their knowledge to find the best scheme for your situation. Each risk will be individually calculated by our sales advisers, who are insurance experts. Along with our tailor made schemes for offshore islands, we believe we offer the best quotation service around. Quicker & Cheaper rates by phone, please click the button below during office hours (9am to 7pm Monday to Friday & 9am to 4pm Saturday) and we will call you back right now, or at a time you specify, for an immediate island insurance quote.